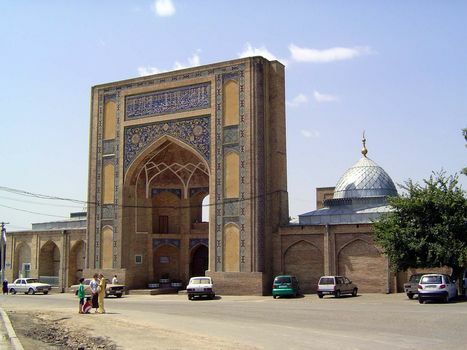 This is the mausoleum and madrasa of Barak Khan, a descendant of Timur or Tamerlane. It was built in the 1500s, and though outshone by similar buildings in Samarkand and Bukhara it does show the form that was repeated as widely in Uzbekistan as the conventional form of a Catholic church is repeated in Quebec. The dominating element is the pishtaq, or high projecting portal, which creates at the entrance a three-sided room, or iwan, in this case vaulted.